I think the guys were as egcidick about the new bread machine as I was. Where their love for kitchen gadgets comes from is a classic nature versus nurture question. We knew it was due to arrive Tuesday, and if Big Guy had had his way, I would have been on the UPS site every 10 minutes to find out where the package was. Turns out, it sneaked in on us. When we did our late-afternoon check, the site said “delivered.” Huh? How’s that? We opened the door, and there it was on the porch: The Zojirushi I’d coveted for years in all its glory. They sat happily and watched the instructional video – no kidding – while I looked over the recipes. 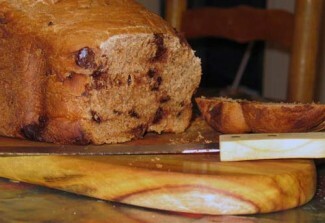 Most were versions of things I already baked regularly, but the chocolate bread caught my eye. Hmm … We needed breakfast food, so why not give it a try? I changed the recipe a bit, using an egg replacer and half white whole wheat flour. Having forgotten how much I hate the tough, dry texture of machine-baked bread, I let Zojirushi finish the work. Never again. It’s a wonder machine in a lot of ways, but oven baked still is best. I’m fairly neutral on this recipe, but the guys love it. Boots says it’s even better topped with SunButter. Warning: This recipe is for a two-pound loaf, so you’ll need to half it for some machines. Put all but chocolate chips in bread machine in the order listed and set machine to dough cycle. Add chocolate chips when the machine signals the add-in cycle. When dough is finished, shape and place in a greased two-pound pan. Bake 30 minutes at 350 degrees. It’s nice to know that EnerG works well with yeast breads and bread machine too. Somehow I have not yet got the courage to deal with yeast. I did try once maybe 2 years back and have not recovered from that disaster yet. Deb aren’t you going to send this to me? It works great with yeast breads! I’m able to use it in a dinner roll recipe that used to be my grandmother’s. The guys just devour it. Once you get ready to give yeast bread a try again, remember to be careful with your water temperature. Too hot and it will actually kill the yeast. It should be lukewarm, but not hot, to the touch. Of course, the great thing about a bread machine is you don’t even have to worry about this because most recipes don’t need hot water. And yes, I’m sending you this one, too. I just forgot to put the link on the other day. It’s there now.